During the 2008 Presidential Election, John McCain proposed a pragmatic national energy policy based upon good stewardship, good science, and reasonableness. George Will attacked his proposal, claiming that “global temperatures have not risen in a decade”. He claimed the hottest year on record was 1998 and no year since has been hotter. His argument was simple, easily understood, and very wrong. While 1998 was an unusually hot year, NASA’s data shows that 2005 was warmer. George Will’s claim resonated with those who wish to deny that the Earth is warming, so they extended the statement to “the Earth hasn’t warmed in 12 years”, 15 years, and finally 17 years – so far. Apparently truthfulness is not a criteria, as 2005, 2010, 2014, were warmer than 1998. Now they claim the International Panel on Climate Change (IPCC) has confirmed their deception. That’s not right, either. The IPCC’s Fifth Assessment Report concluded that the global surface temperature “has shown a much smaller increasing linear trend over the past 15 years [1998-2012] than over the past 30 to 60 years.” The apparent slowdown was termed a “hiatus” and cheered by the Skeptics, although a “smaller increasing linear trend” is not a hiatus. The apparent slowdown intrigued the climate scientists, who immediately set about trying to discover where the energy went. Scientist knew the energy had to go somewhere because of the First Law of Thermodynamics, which says that energy is conserved. The amount of carbon dioxide in the atmosphere was still rising and, because of the greenhouse effect, the Earth was still absorbing more energy that it emitted. According to the conservation of energy, that extra energy has to go somewhere in the environment, and whether it warms the air, the land, the oceans, melts ice, or evaporates water – the Earth was storing the energy somewhere. Claiming that “global warming has paused”, is badly misleading as the amount of energy in the Earth’s systems was still increasing. To claim a pause is to claim that the Law of Conservation of Energy is invalid. And, that is an extraordinary claim, requiring extraordinary proof. No Skeptic was up to that task. What followed was a flurry of research by climate scientists, trying to figure out where the energy had gone. It turned out that it really hadn’t gone anywhere, because the missing heat has been there all along. It was an artifact from how the ocean temperatures were measured. Tom Karl, director of the National Centers for Environmental Information, is the lead author of the study published in the journal Science. He explained the discrepancy came from a change in how ocean temperatures were measured. “Global ocean temperatures are estimated both by thousands of commercial ships, which record the temperature of the water entering their engines and by thousands of buoys. The buoys tend to get cooler temperature readings than the ships, likely because ships’ engines warm the water. Meanwhile, in recent years, buoys have become increasingly common.” The result, Karl says, is that the oceans did not appearing to be warming as much because more buoys are now being used instead of ships. So Karl’s team adjusted the buoy data to make them line up with the ship data. 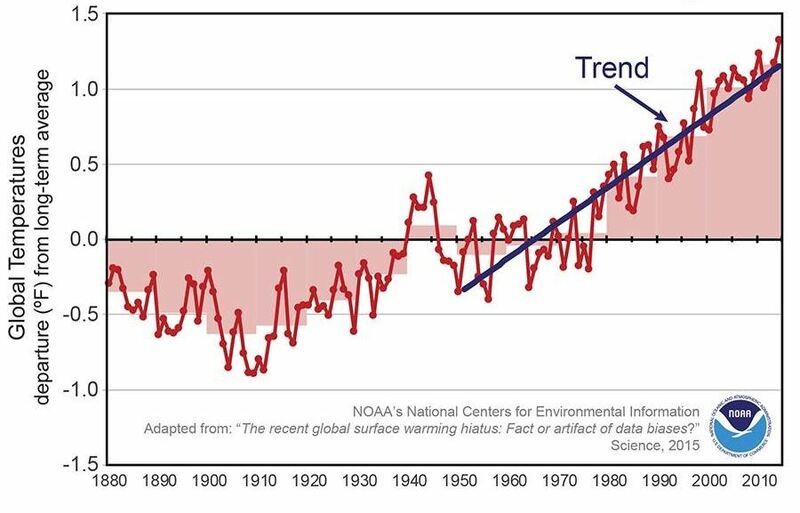 The corrected data, in the graph below, shows that since 1998, the rate of warming is about the same as it has been since 1950: about two-tenths of a degree Fahrenheit per decade. The Skeptics, of course, were not happy that the missing heat had been discovered and their ” hiatus” was exposed as a myth. So, they have now gone back to their familiar theme, that “scientists adjust the data to get what they want.” Saying that is certainly easier than disproving The First Law of Thermodynamics. This entry was posted on Tuesday, July 14th, 2015 at 5:29 pm	and is filed under Global Warming, Uncategorized. You can follow any responses to this entry through the RSS 2.0 feed. You can leave a response, or trackback from your own site.